Hillary Clinton takes a photograph with supporters at a campaign office in Seattle on Friday. 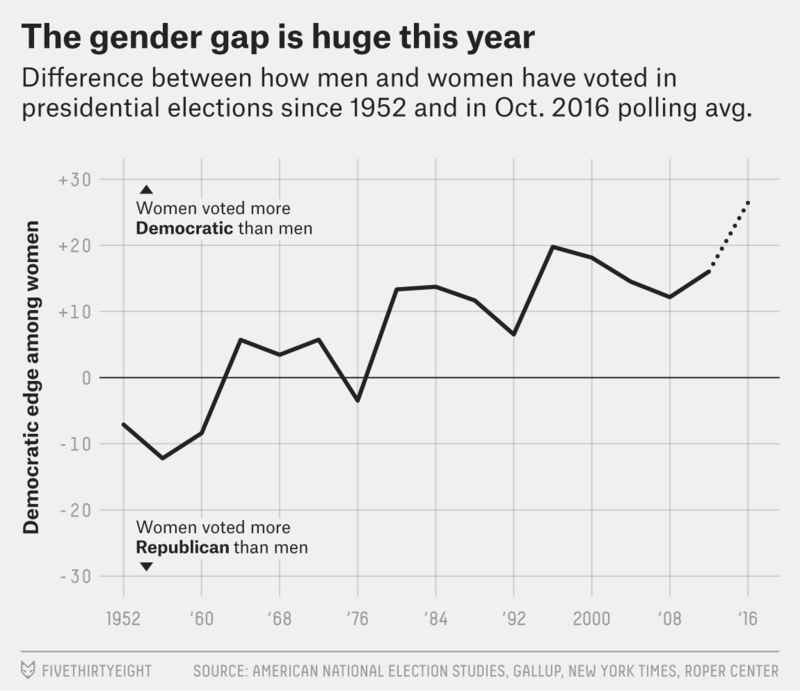 We could be looking at the largest gender gap in a presidential election since at least 1952: Men are favoring the Republican nominee, Donald Trump, in typical numbers, but a historically overwhelming share of women say they will vote for the Democrat, Hillary Clinton. As my colleague Nate Silver has pointed out, women are winning this election for Clinton. Between the historic nature of Clinton’s candidacy, Trump’s record of misogynistic comments and now the Trump tape and allegations of sexual assault against Trump, American men and women are incredibly split on the 2016 election. But that split isn’t symmetrical. In an average of the most recent live-interview polls from each pollster to test the race in October, Clinton holds a 20-percentage-point advantage among women, and Trump is winning more narrowly among men. The most recent live-interview poll conducted in October that FiveThirtyEight had by each pollster as of 12 p.m. on Oct. 16. NBC News/Wall Street Journal survey is between just Clinton and Trump, while other polls included third-party candidates as choices. All polls are rounded. The first thing to note: We haven’t seen anything like Clinton’s 20-point lead over Trump among women in decades. Women favored Bill Clinton by about 20 percentage points in 1996 (a landslide election), but the last time women favored either party’s nominee by more than 20 points was in 1972, when Republican Richard Nixon crushed Democrat George McGovern among both sexes. The only Democrat ever to win women by more than 20 points was Lyndon Johnson in 1964 — also in a blowout. Four years ago, President Obama carried women by only about 12 points. Even when he first won the White House, in 2008, by about double his 2012 margin, his margin among women was only 14 points. And yet, Trump is still carrying men. If the live-interview polls are on the mark, the difference between how men and women vote — the gender gap — in 2016 would be historic. Dating back to 1952, there has never been a 26-percentage-point gender gap. When we talk about the gender gap, we’re normally looking at a difference of about 15 percentage points (the average since 1980). The largest gap we’ve seen came in 1996, when it was 20 points. To put this year’s gender split into a little more context: Trump’s 7-percentage-point lead among men is about how well George W. Bush did with men in 2000. 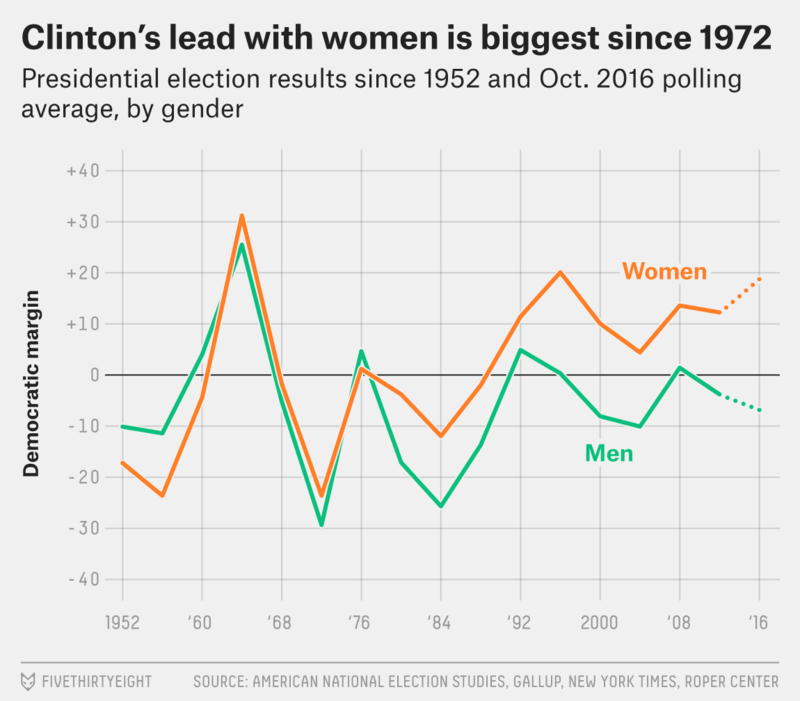 If we had an average gender gap this year, we’d expect Clinton to carry women by between 5 and 10 points (given how men say they are going to vote). That kind of gap would result in a close race overall, which is exactly what the state of the economy suggests should be occurring. It’s possible the gender gap on Election Day will turn out smaller than indicated by current live-interview polls. Nonlive polls, for instance, such as those conducted online or via automated voice technology, have found a smaller gender gap. That could be because online polls and robo-polls tend to require heavier weighting — the raw samples reached by these polls often aren’t as representative. Live-interview polls tend to be more accurate, on average, which is why they are studied here, but the nonlive polls could be closer to the mark this year. We also don’t know whether or not Clinton’s large lead among women is more a pro-Clinton or an anti-Trump vote. My guess is it’s probably a little bit of both. One thing to keep an eye on over the next few weeks, though, is whether the gender gap begins to widen even further, as perhaps more sexual assault allegations against Trump come out. If it does, it could be an argument that the strong Democratic vote among women this year is more anti-Trump than pro-Clinton. Exit poll data is only available since 1972.